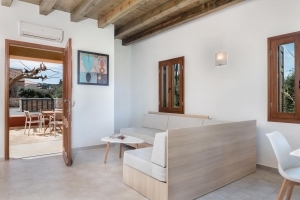 The “Androulakis Apartments” are built on the family estate, in the quiet area of Kato Geraniou Kydonias, 14 km west of Chania and just 2 km from cosmopolitan Platania, on Crete’s northern coast. The location is ideal for quiet, stress-free holidays. the estate’s 12,000 m2 are full of trees, plants and flowers that put you in total contact with nature. The grounds also contain a pool that we clean and maintenance carefully, for your health and safety. The pool includes a safe area for children that is shallow and cordoned off. Our accommodations include six duplex apartments, three single-level apartments and 2 newly built suites. All apartments have fully equipped kitchens (two electric burners, small oven, refrigerator, sandwich grill, electric kettle), as well as all the necessary kitchenware (tableware, plates, glasses, pots and pans). Each apartment also has its own toilet and shower, table and chairs, and couches for internal spaces. Verandas are also equipped table and chairs, with a view of the swimming pool or the beautiful orange orchard. All the rooms are air-conditioned and equipped with a safety box, and can accommodate from 2 to 4 persons. Free WiFi is also available throughout the premises, and there is ample free parking for our guests.